MAJOR PRICE REDUCTION! With sweeping views of Central Park, the Reservoir, and the NYC skyline to the West, South, and East, Apartment 14A offers a unique and high quality blank canvas for the discerning buyer to create a true masterpiece. 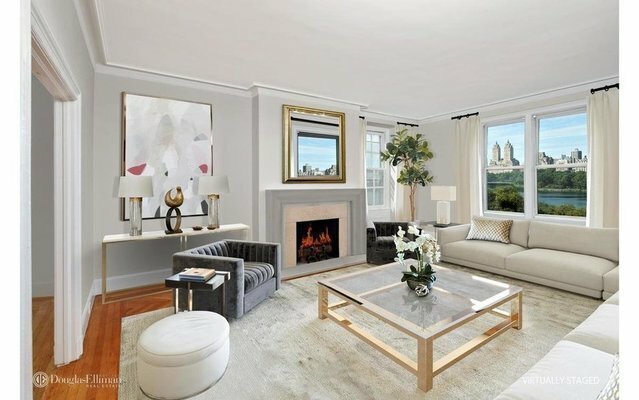 This extraordinary, high floor, prewar, eight room cooperative apartment is grand in scale with 66 feet of Central Park frontage, a gracious floor plan, beautifully proportioned reception rooms, 3 large Park facing bedrooms (or 2 bedrooms and a library), and extra-high ceilings. Located on the penultimate floor of the building, the apartment has not traded hands since the 1950's. From its semi-private elevator landing, which leads to a beautifully scaled 40 foot central gallery, the apartment boasts wonderful light and flow between its South-Western corner living room with WBF and its large corner dining room with open Eastern views. Exceptional in its stunning vistas, multiple exposures, all-day sun, and lovely proportions, this area offers numerous reconfiguration options for spectacular everyday living and entertaining. The three bedrooms and two baths all feature superb Western views. The huge kitchen/breakfast/staff areas present a rarely available, well located, flexible space in which to create a buyer's dream kitchen with eating, family, office, and staff areas. Large closets, herringbone floors, and pretty prewar design details abound throughout. WD in place and central air permitted with board approval. Built in 1923 and designed by renowned architect, JER Carpenter, 1148 Fifth Avenue is a full-service white-glove cooperative, with a full-time staff of doormen and porters, access-controlled elevators, a live-in resident manager, a fully-equipped gym, a bicycle room, and storage units for shareholders. This building is pet-friendly. 2% flip tax paid by the buyer. M-F showings from 9:30-4:30. Do not let this once in a generation opportunity pass you by.